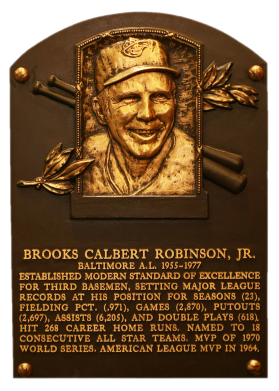 One of the greatest fielding third baseman ever, Brooks Robinson won the Gold Glove 16 times in 23 seasons. The AL MVP in 1964, Brooks turned in a .317 average, 28 homers, and a league-leading 118 RBI. He sparkled in postseason play, posting a .348 average in 18 ALCS games. In the 1970 World Series, he led the Orioles over the Reds, hitting .429 and turning in one spectacular fielding play after another. He had 268 career homers, 1,357 RBI, and 1,232 runs. Comments: I've always had the 1957 Topps rookie card tagged as the portrait card to have and purchased my first example, a PSA7, in August, 1999 from Andy Madec. In August, 2000 it was sold shortly after I upgraded to this PSA 8 example with an eBay purchase from American Sport Collectibles. The appropriately orange-hued card features a strong perimeter, bold obverse with an overall cleanliness and Oriole incandescence uncommon for the issue. This is a true gem, with high end centering, a clear, bright image (in contrast to many), lustrous surfaces and the requisite strong corners. 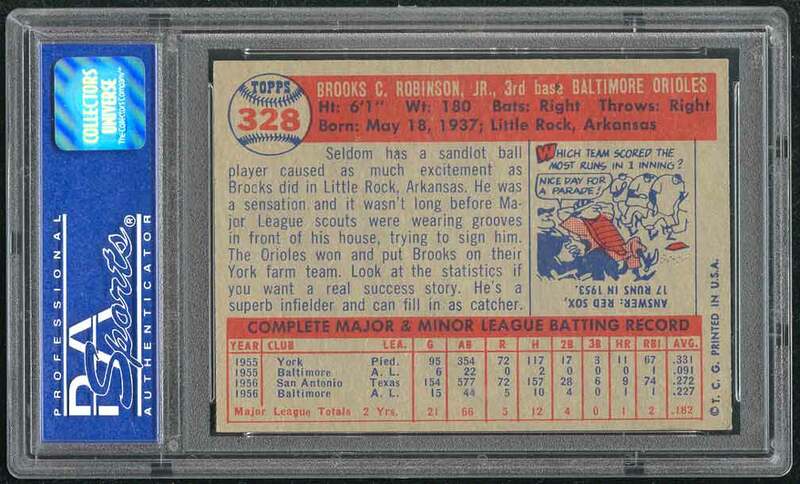 An outstanding example of the rookie issue of a very beloved Hall of Famer in strict Near-Mint condition! 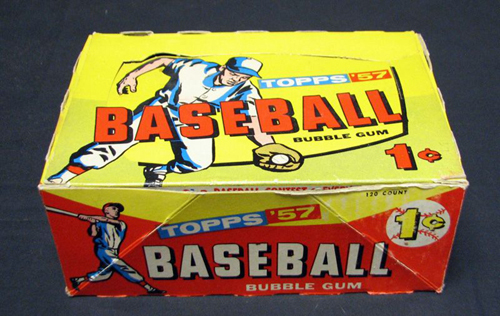 It's a brilliant example of one of the most famous Topps rookie cards ever produced! The centering is near perfect and the corners are oh-so-close to MINT. 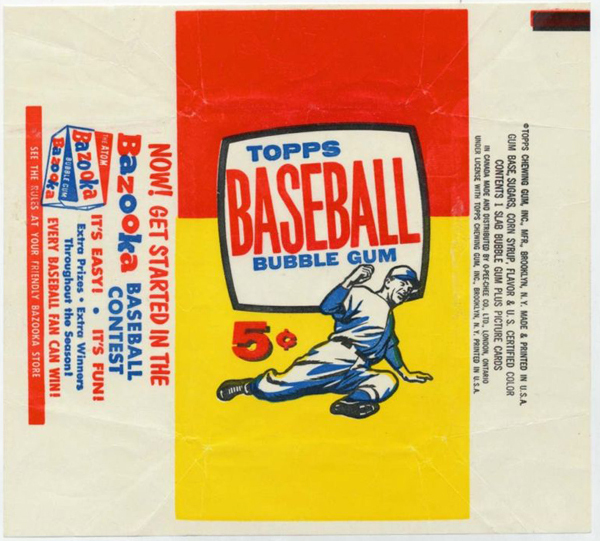 Description: For 1957, Topps reduced the size of its cards to the now-standard 2-1/2" X 3-1/2"." Set size was increased to 407 cards. Another change came in the form of the use of real color photographs as opposed to hand-colored black and whites of previous years. For the first time since 1954, there were also cards with more than one player. 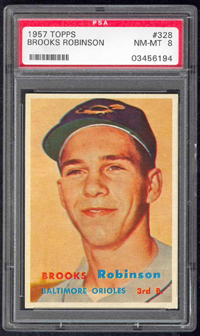 The two, "Dodger Sluggers" and Yankees' Power Hitters" began a trend toward the increased use of multiple player cards. Another first-time innovation, found on the backs, is complete player statistics. 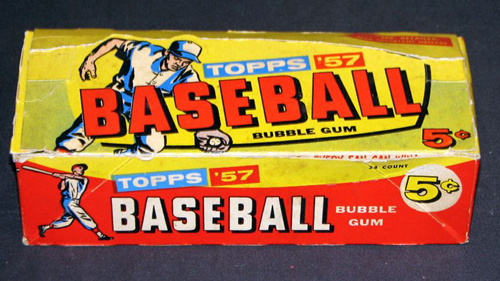 The scarce cards in the set are not the highest numbers, but rather 265-352. Four unnumbered checklist cards were issued along with the set. 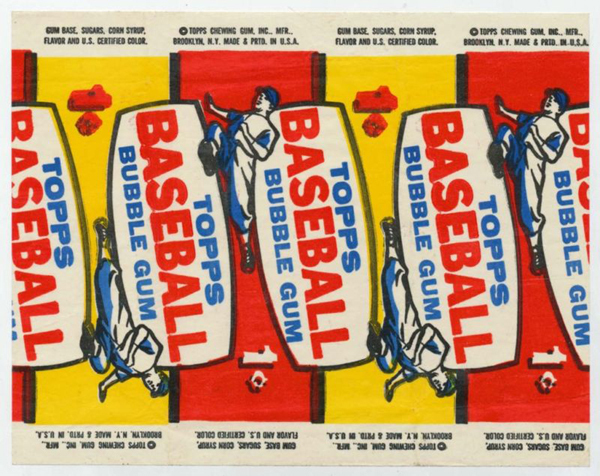 Several rookies were included in the 1957 Topps set including four future HOFers - Don Drysdale, Brooks Robinson, Jim Bunning, and Frank Robinson.